The power of thinking positively makes an overwhelming difference. Practicing to see the positive aspects in each situation gives you a feeling of gratitude rather than focusing on the negatives and feeling sad. If you want to change your mindset when recovering from substance use disorder, it could be much more simple than you think. 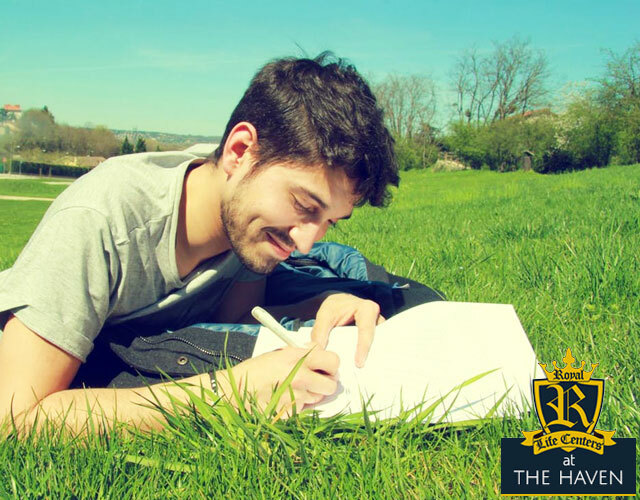 Our addiction treatment center, Royal Life Centers at The Haven employs many exercises that increase happiness and positive thought processes. A substance use disorder, as defined by doctor Thomas Kosten, is a mental health disorder that “describes a pathologic pattern of behaviors in which a person continues to use a substance despite experiencing significant problems related to its use” (Kosten). If you are unsure if you or a loved one has a substance use disorder, please consult the list below, which is the diagnostic criteria for a substance use disorder— as originally outlined in the Diagnostic and Statistical Manual of Mental Disorders. Craving or strong desire or urge to use the substance. Recurrent substance use resulting in a failure to fulfill major roles at home, school, or work. Substance use is continued despite knowledge of having a persistent or recurrent physical or psychological problem that is likely to have been cause or exacerbated by the substance. If two or more of the above points ring true for you or your loved one, you may have a substance use disorder and should seek help for addiction treatment immediately. Addiction is a chronic and progressive disorder, with signs and symptoms that get worse with continued alcohol or drug use. Please reach out to us. Researchers at the Massachusetts General Hospital Recovery Research Institute report that “brief, text-based, self-administered exercises can significantly increase in-the-moment happiness for adults recovering from substance use disorders” (Massachusetts General Hospital). These positive psychology exercises change your mindset by boosting happiness in adults who are recovering from drug or alcohol abuse. One of the exercises used in the research study from Massachusetts General Hospital was a text-based exercise that took an average of four minutes to complete. This exercise is called “Reliving Happy Moments” and it asked participants to choose one of their own pictures that captured a happy moment, and add text describing what was happening in the photo. Another exercise allowed participants to describe two positive experiences that happened the day before. This exercise is called “Savoring” and allows for participants to recount the positive moments that they noticed in their day yesterday. A third exercise is called “Rose, Thorn, Bud”— it’s where participants list a highlight and a challenge from the day before, followed by something they were looking forward to tomorrow. These exercises lead to significant increases in happiness. The effect of participating in these exercises were high gains in happiness. An associate professor of Psychology in the Department of Psychiatry at Harvard Medical School says “These findings underscore the importance of offsetting the challenges of recovery with positive experiences” (Bettina). Essentially, including small ‘happiness exercises’ during addiction treatment will improve happiness in guests who are recovering from an alcohol or substance use disorder. Often times, the aftermath of drug addiction causes us to focus on all that we have lost, instead of focusing on what we have and what we are gaining each day. Positive thinking is promoted through these exercises to boost spirits and remind guests that there is so much to be happy about. Scientists have been advocating for treatment programs to include more protocols that encompass quality of life. At Royal Life Centers, we believe in therapeutic activities that broaden our guest’s quality of life— which is why we offer adventure therapy, activity therapy, and equine therapy. Royal Life Centers at The Haven provides superior medical detox programs. Our medical detox exists for the purpose of safely removing substances from the body, while keeping the guest as safe and as comfortable as possible. Upon arrival to our facility, guests will be assessed for their withdrawal symptoms, and evaluated for any co-occuring disorders. We use intensive therapies to facilitate healing in the mind, body, and spirit. Our treatment programs support long term sobriety, and we designed treatment programs that follow guests through the stages of recovery. We have both short term and long term treatment options. Our treatment programs at Royal Life Centers include: medical detox, a residential inpatient program, a partial hospitalization program (PHP), an intensive outpatient program (IOP), an outpatient program (OP), sober living and graduate housing. Our treatment uses behavioral therapies and support groups to teach guests about topics ranging from grief and loss to how to prevent a relapse. Our facilities are co-ed, meaning that both men and women have access to our treatment programs. We also provide services to guide and support family members while their loved one is in our care, and when their loved one graduates our programming. Kosten, Thomas. “Substance Use Disorders – Psychiatric Disorders.” Merck Manuals Professional Edition, Merck Manuals, www.merckmanuals.com/professional/psychiatric-disorders/substance-related-disorders/substance-use-disorders. Massachusetts General Hospital. “‘Happiness’ exercises can boost mood in those recovering from substance use disorder.” ScienceDaily. ScienceDaily, 18 January 2019. . If you or someone you know is struggling with a substance use disorder, please reach out to our addiction specialists for guidance at (877)-RECOVERY or (877)-732-6837. Our team is available to take your call 24 hours a day, 7 days a week. Because We Care.